A contemporary paranormal romance that will keep you turning the page! Melissa thinks she’s taking a huge risk in going on holiday with Rory Hepburn. He may be gorgeous, but she only met him three days ago. But when she sees the old watermill in rural France, she is delighted. Within ten minutes of her arrival, she sees the man in black, but thinks nothing of it. Concentrating more on keeping her secrets and sleeping alone, she is shocked when ghosts disturb her first night at the mill. Not just one ghost, but two. When Christophe arrives at the mill, the chic Frenchman regards Melissa as his soul mate, and Melissa knows she’s in real trouble. A chilling tale, written with humour and drenched in the sights and perfumes of the rural Dordogne, this is a must-read tale for those who like a romance with a ghostly twist. 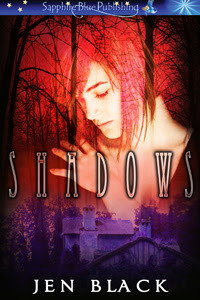 An avid follower of Jen Black’s novels, I could not resist reading Shadows, her newest book and first venture into contemporary paranormal romance. When Melissa meets the handsome Rory at a party, she is instantly drawn to him, but is hesitant and a bit mistrustful due to past romantic failures she has been painfully trying to put behind her. Rory invites her for a three week holiday in France at an ancient mill. Unexplainably drawn to him, Melissa agrees, and is determined to enjoy herself despite the fact she remains wary and does not easily trust him. Shadowed by the secrets of their past, and surrounded by the spectacular beauty of the old mill, Rory and Melissa’s holiday soon turns perplexing and secrets begin to emerge. Not only do they encounter ghosts, but secrets of their past begin to emerge. Mysterious and explosive emotions develop between them, threatening to shatter her trust in Rory. I love a great ghost story and this novel definitely does not disappoint. Shadows is an exciting read, filled with plenty of secrets and mystery. As with her other novels, Jen’s writing is powerful and fast paced, offering wonderful descriptions and plenty of details that not only make you feel as if you were in France with the couple, but that build endearing and memorable characters. An extremely compelling book!